This wonderfully unique collaboration brings together two masters of their fields, joining original words by spiritual teacher Eckhart Tolle with delightful illustrations by Patrick McDonnell, the creator of the acclaimed comic strip MUTTS. Every heartwarming page provokes thought, insight, and smiling reverence for all beings and each moment. More than a collection of witty and charming drawings, the marriage of Patrick McDonnell's art and Eckhart Tolle's words conveys a profound love of nature, of animals, of humans, of all life-forms. Guardians of Being celebrates and reminds us of not only the oneness of all life but also the wonder and joy to be found in the present moment, amid the beauty we sometimes forget to notice all around us. "An inspired collaboration between spiritual teacher Eckhart Tolle and comic strip artist Patrick McDonnell...A book to make you wriggle with joy." -- O, The Oprah Magazine "A lovely meditation on the power and grace animals bring to our lives." -- The Bark "The gentle humor and profound insight found in this book -- thoughts such as 'Allow your dog to take you for a walk every day. It's good for the body and it's good for the soul' -- make it the perfect gift for animal lovers of all ages." 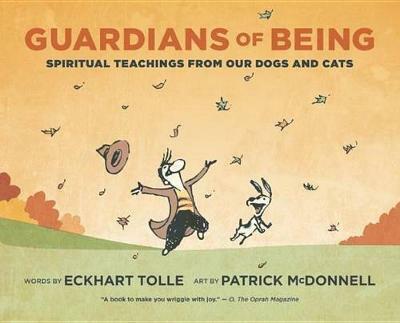 -- Inspired Retailer "Eckhart Tolle and Patrick McDonnell fans will rejoice over Guardians of Being, the combined effort of these bestselling authors. This beautiful, thought-provoking, and enlightening book pairs Tolle's 'Power of Now' mindfulness with McDonnell's beloved MUTTS characters, showing how we can find 'true happiness in simple, seemingly unremarkable things' by simply being present, a state that our dogs naturally occupy. The skillful use of the MUTTS animals to illustrate Tolle's theme renders his philosophy into easily grasped concepts. This thoroughly charming book deserves a place on your coffee table. While you're at it, why not pick up a copy for your best friend, too?" -- Modern Dog "This is a book likely to speak to dog lovers, cat lovers, art lovers, spiritual seekers, those who like to read, those who don't like to read, and pretty much anyone interested in the art of life." "He is a prophet for our time." "One of the best comic strips of all time." Eckhart Tolle, a number one New York Times best-selling author, speaks and teaches extensively throughout the world. He lives in Vancouver. Patrick McDonnell, the creator of MUTTS, has more than 20 books in print. He lives in New Jersey.